Visit El Mokattam Mountain Cave Church, or the Monastery of St Simon, on a private tour that also explores the magnificent churches of Coptic Cairo. You’ll see some of Cairo’s most important Christian sites, including the Saints Sergius and Bacchus Church, the Church of Saint Barbara, and the Hanging Church, while going beyond sightseeing for a glimpse of ‘garbage city,’ a fascinating Cairo neighborhood that most visitors overlook entirely. At 8:00 am you need to be ready at the lobby area of your hotel in Cairo. you will find your expert tour guide holding a sign of your name. 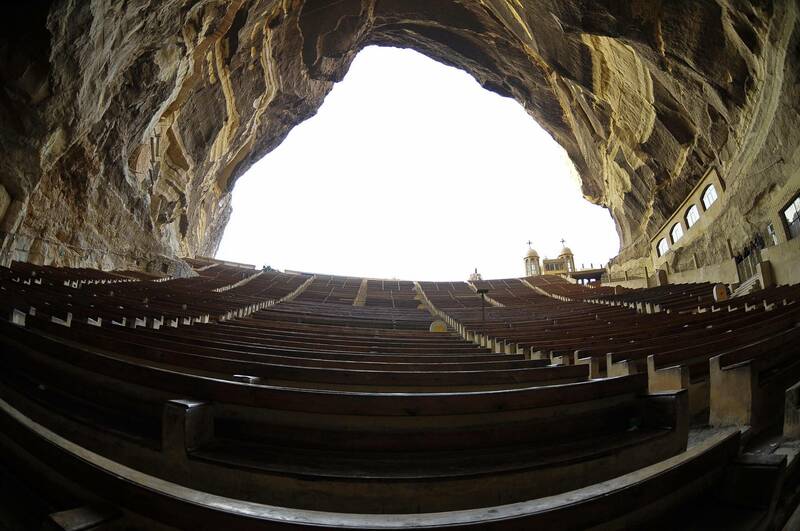 At the first you will visit to the "Cave Church" in Egypt which is one of the largest churches in the country, a place where 70,000-plus Christians gather every week to worship and praise Jesus -- a place that's home to one of the world's oldest Christian communities. The cave, also known as the Monastery of Saint Simon, is located in the Mokattam mountain in southeastern Cairo, in an area known as "garbage city" due to the large population of garbage collectors, or Zabbaleen, that live there. Visit to Old Cairo where you see some of the earliest christian churches at Middle east from 300 AD visit the Church of Abu-Sergah and St. Barbara, the hanging church, and the old Jewish synagogue called Ben Ezra Synagogue.